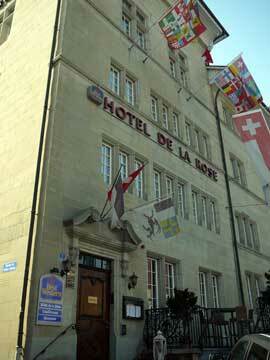 The Hotel de la Rose in Fribourg is a 4-stars hotel located in the center of Fribourg. The hotel can be reached with a 15 minutes walk from the Fribourg train station or a five minutes drive from the Fribourg Nord exit of the A 12 highway. The Hotel de la Rose in Fribourg offers 39 renovated rooms and one suite in an historical building from the 17th century. It is located in the heart of the old town of Fribourg, in a historical quarter near the old University. The St. Nicholas Cathedral, the Art and Historical Museum, the Tinguely Museum and the Gutenberg Museum are all within very short walking distance, if not just across the street. There are also many excellent restaurants around the hotel. The Hotel de la Rose offers space for seminars, conferences and exhibitions that can accommodate up to 60 guests. There is also a dancing in the hotel. Travelers like this hotel for its location and the friendly staff. Rates for the rooms range from 100 to 190 Swiss francs.